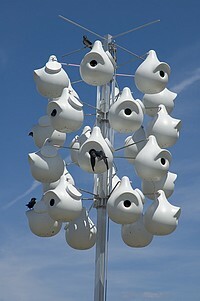 Gourd birdhouses, although most popularly used for Purple Martins, will also attract other species including bluebirds, woodpeckers, wrens, nuthatches, chickadees, finches and swallows. 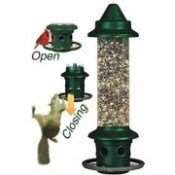 They can also serve dual purpose as feeders too when the birds are completed with nesting season. You can either grow your own gourds and dry them out or purchase natural gourds already cleaned, dried with hole cut out and ready to hang up. We have also seen gourd bird house kits that provide you with the gourd, tools and dyes to color (though I say keep it natural) which would be semi-DIY. Besides growing gourds yourself from seed, the next cheapest option is to buy dried, but not washed gourds. All you need is some steel wool or those green dish scrubbies to get the outside looking smooth, clean and bright by removing the dried mold and dirt. Cleaning is not an absolute requirement - it just makes it look nice and pretty. There are also gourds made from durable man-made materials such as high density polypropylene. Our preference has always been to choose things made from natural materials when possible just because we like the look and, well, it's natural! But, some may prefer these because they are very easy to clean, very weather resistant and long-lasting. Note that hole size of the gourd will need to vary according to the species you wish to attract. 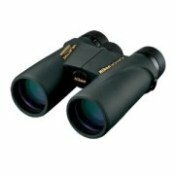 You can view the hole size requirement for different birds here at our bird house dimensions page. If you grow your own gourds, know that if you want to use them as bird houses it will take several months to as much as a year to completely dry them out. 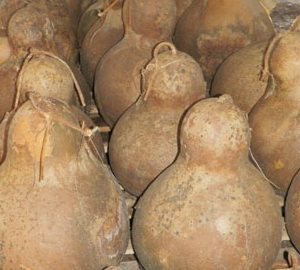 Hence the reason why many people will buy already dried gourds. Growing gourds from seed is not too difficult, you just need time and space. There are lots of different species of gourds, so make sure you plant the correct kind. The large birdhouse gourds come from the Lagenaria family and can create vines up to 30 feet long, depending on the species. Below are birdhouse gourd seeds for sale. You start in the spring just like you would with other garden plants. They require full sun all summer long and some good warm weather in order to give you nice, big gourds by fall harvest. Like pumpkins, they grow vines which produce flowers that eventually turn into the gourds. 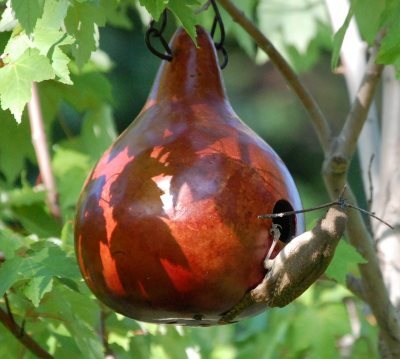 In order to grow your gourd birdhouses to a size of at least 9-10", it will take about 150 to 180 days. Some people will tell you that you need to cut your gourds off the vine and bring them inside your house in order to dry them. 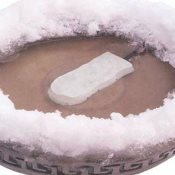 Yes, eventually they will dry using this method, but the experts say this is not the best way. In order to get the highest quality dried gourds, leave them attached to the vine and let them dry in your garden. In fact if you do pick them while they are still green and not yet fully matured, they are more susceptible to rot then if you just leave them out on the ground. Gourds left on the vine until they are completely dried will harden off better and tend to be of higher quality than those picked early. No worries about rain, snow and freeze - just walk away and let them do their thing. The only issue is when a gourd had not fully matured and is still green before say a freeze kills the plant. You may be able to salvage it by drying it inside, but know that it is more susceptible to rotting than a gourd that has fully matured. Birdhouse gourds from the Lagenaria family are nearly 90% water and will take longer to dry, from 3-12 months, depending how humid your climate is. You know when a gourd has dried out when it feels very light and the seeds inside rattle when shaken. Here Jerry from the Handy Craftsman Show gives a pretty thorough run down of how to make a gourd birdhouse from start to finish. You will need a few tools, but nothing that most people would have in their basic toolbox. If you do not want to go through the whole process of growing, drying and making your own gourd birdhouses, then here are a few for sale that are ready to go - just hang before the nesting season begins and watch the birds move in!